The success of her food blog inspired Anne Faber to produce a cookbook and TV series showcasing British cuisine. The show, and the book and blog, also serve as a sort of travel guide to different London neighbourhoods. “London is very accessible for Luxembourgers, but not everyone knows about the city. It still has mystery for them, not like Paris, where it seems every Luxem- bourger has their favourite places.” Indeed, even after 10 years as a resident Anne is still discovering new aspects of the British capital. 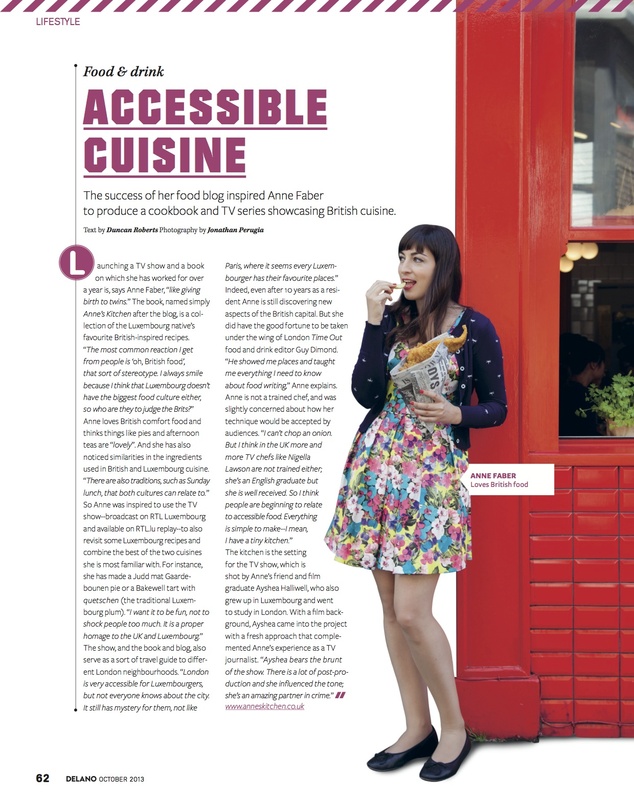 But she did have the good fortune to be taken under the wing of London Time Out food and drink editor Guy Dimond. “He showed me places and taught me everything I need to know about food writing,” Anne explains. to study in London. With a film background, Ayshea came into the project with a fresh approach that complemented Anne’s experience as a TV journalist. “Ayshea bears the brunt of the show. There is a lot of post-production and she influenced the tone; she’s an amazing partner in crime.”.